Despite the blip, Wahab bowled a brilliant over to help his team win the game by just one run. 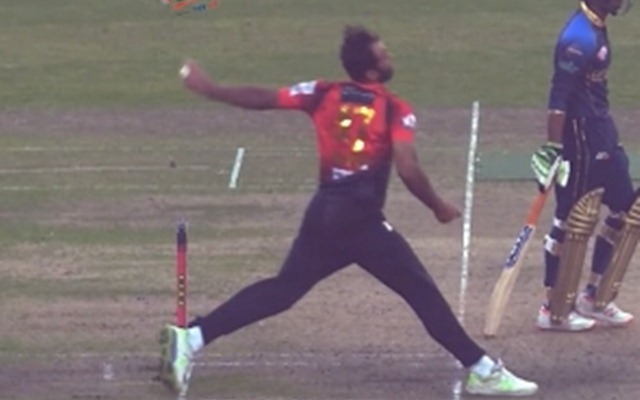 Pakistan pacer Wahab Riaz embarrassed himself in the 39th match of the ongoing Bangladesh Premier League (BPL). He is playing for the Comilla Victorians and the game was against the Dhaka Dynamites. The game had gone down the wire with the latter side needing 20 runs off 11 balls and Riaz was given the responsibility of bowling the all-important penultimate over of the innings. Amidst all the wild celebrations, the on-field umpire decided to take the matter upstairs checking for a no-ball. To everyone’s surprise, including Wahab Riaz, in an attempt to bowl a pacy bouncer, he had overstepped and the no-ball was called. It was an embarrassing moment for the Pakistani pacer as not only Russell was reprieved, the next ball was a free hit. The game suddenly turned in the favour of the Dynamites which left him frustrated. Shuvagata Hom faced the free-hit and slammed the ball in the air which was dropped in the deep this time. Any which ways it wouldn’t have been a wicket even if the fielder had caught it. Despite this blip, Wahab bowled a brilliant over to keep the opposition at bay and the Victorians won the game by just one run. Moreover, Wahab Riaz ended with the decent figures of 1/22 but would’ve loved to bag Russell’s wicket in the 19th over to seal the game.